← Beloved, Beguiling, Beautiful Bacon! “Taos Pueblo Elders say that at the beginning of Time, when all of the People were gathered together preparing to walk upon Mother Earth, the Creator spoke to them and gave them four kinds of corn: blue, yellow, red, and white. The Creator told the People that they would be the caretakers of corn and taught them how to plant and harvest and how to use corn for food, medicine, and prayer. Native Americans in the Southwest have treasured blue corn for generations, for it’s distinctive blue colour and it’s earthy flavour. 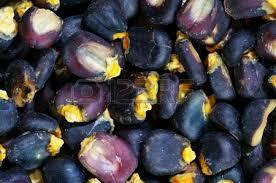 Blue corn derives its hue from anthocyanin, the same pigment found in blueberries, Concord grapes and violets. To achieve the intense lavender-blue colour of the cornmeal, it is often treated with an alkaline substance such as “culinary ash”, or baking soda. In addition to being a food, in Pueblo traditions, a paste made of blue cornmeal and water is thought to relieve aching joints. “Culinary ash” is produced from burning wood from certain trees until only ash is left. 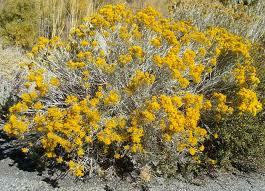 In the Southwest, the Navajos use juniper to obtain the ash, while the Hopis use green plants such as chamisa bushes. The ashes contain a high mineral content, which increases the nutritional value of the foods they are used in. 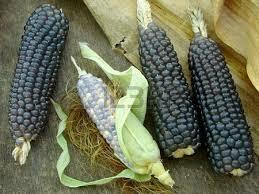 The addition of the ash to boiling water and corn also changes the corn to a more intense blue colour. 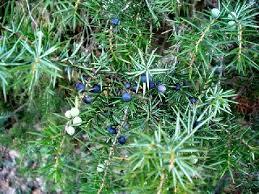 Juniper was preferred by the Navajo to burn for the ashes used in making blue corn breads, etc. One of my Southwest cookbooks is “The Blue Corn Cookbook” by Celine-Marie Pascale, published in Albuquerque in 1990. There are numerous recipes using blue corn in breakfast dishes, appetizers, entrees and side dishes, soups, stews, casseroles, pasta and desserts. I chose to make “Taos Blue Corn Bread“. If you live in the Southwest, as I do, you can usually obtain blue cornmeal from local stores, and even some of the larger chains (like Albertson’s or Smith’s) often have a display of items from local producers. I purchased 24 ounces of blue cornmeal from Sichler Farms, in Albuquerque, which feature products from “Los Chileros de Nuevo Mexico” (www.loschileros.com) from Santa Fe, New Mexico (you can order any of their products online). Add 1/4 cup of chopped green chile (I used frozen, which I had previously roasted and de-seeded) A tablespoon extra wouldn’t hurt! Preheat the oven to 350 degrees and lightly grease an 8” square pan. Combine the dry ingredients. Mix the milk and egg; then add them to the dry ingredients. Stir in the melted bacon fat or butter and mix lightly. Add the chopped green chiles, mix well and pour into the prepared pan. Bake for 30 minutes. Makes approximately one dozen servings. 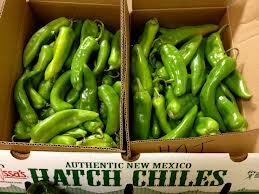 So many “imposter” chiles have intruded into the state from other states, and even from overseas that in order to protect and preserve the integrity of chile grown in New Mexico, a law was recently passed to create a Certification Mark, which guarantees that the chile you are purchasing, advertised as New Mexico, IS indeed “New Mexico Certified Chile™”. After baking for 30 minutes, the cornbread was done and smelled heavenly: the rich, earthy smell of smoky corn and chiles, with just a hint of something sweet. The taste: delicious! Enjoy the Taos Blue Corn Bread. If you have any blue cornmeal leftover and your joints are aching, try a paste of blue cornmeal and water and spread on the afflicted area. Let me know if it helps! This entry was posted in Comfort Food, Cookbooks, Cooking, Cooking and Social History, Eating, Native American Cuisine, Recipes, Uncategorized, Vintage Cookbooks and tagged Albuquerque, Blue Corn, Chile, cookbooks, Cooking, Culinary Ash, food history, Green Chile, Hopi, Navajo, New Mexico, Southwest, Sue Jimenez, Taos Blue Corn Bread, Taos Pueblo. Bookmark the permalink.